Rare bird's-eye view of Williams College campus. 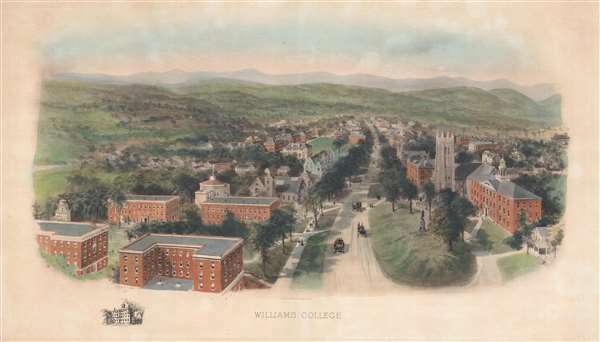 This is a rare 1906 Richard Rummell view of Williams College, a private liberal arts college located in Williamstown, northwestern Massachusetts. The view looks west along modern day Spring Street (Route 2), through Williams College toward the Berkshire Hills in the distance. Thompson Memorial Chapel and Griffin Hall appear in the foreground on the right. In the left foreground are Currier Hall and Fitch House. The Octagonal building on the left is the former Lawrence Hall, designed by Thomas A. Tefft in 1846, which has today been incorporated into a larger building that houses the Williams College Museum of Art. Just beyond is he college residential building Morgan Hall and the modern-day Flak Science Quad. Rummell began issuing views of American colleges around 1905. Rummell's views come in several different forms including color, as here, and black and white. Like most of Rummell's university views, it is copyrighted by his publisher, W. T. Littig and Company. In more recent times Arader Galleries has acquired many of the original printing plates for Rummell's college views and currently issues re-strikes, but the original early 20th century printings, as here have become extremely rare. We have encountered many of Rummell's view over the years, but this is the first time we have seen an original of Williams College.